What’s behind Sean Hannity's disgraceful Seth Rich conspiracy theories? Hannity doesn’t realize what he’s doing. Successful Americans, experts say, confront the “Sunday night blues” by spending time with their loved ones, organizing themselves for the coming work week, and unplugging from the internet before bed. Fox News host Sean Hannity spent last night sending an increasingly frantic series of tweets about a deranged conspiracy theory. Hannity devoted several editions of his TV and radio shows last week to diving into the fever swamp with widely debunked speculation that Democratic National Committee staffer Seth Rich was murdered last summer by Democrats in retribution for leaking DNC emails to WikiLeaks. This evidence-free nonsense contradicts both the U.S. intelligence community’s finding that the emails were hacked and distributed by Russian intelligence services and law enforcement’s conclusion that Rich was likely the victim of a botched robbery. While Hannity was pushing new, quickly debunked developments in the story, Rich’s devastated, long-suffering family was demanding Fox retract its reporting on the murder and firing off a cease-and-desist letterto the “private investigator” behind the new wave of stories. But Hannity shows no signs of stopping -- over the weekend he invited on his show Kim Dotcom, a hacker “now fighting extradition to the United States on copyright infringement and wire fraud” who claims to have proof linking Rich and WikiLeaks (none of this makes sense). Hannity doesn’t realize what he’s doing. “Sean Hannity is actually a very nice guy,” Commentary magazine editor John Podhoretz tweeted on Tuesday night, after Hannity started talking about the conspiracy theory. “If he realized how horrible this is to the grieving Rich family, I'd bet he'd stop. 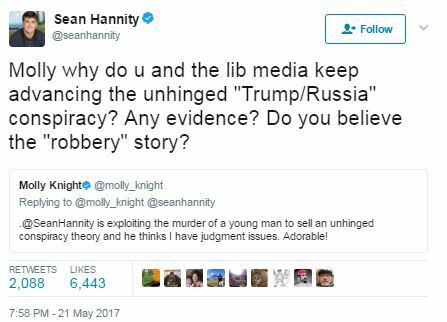 Think, Sean.” Under this explanation, Hannity simply got ahead of his own good judgment, failing to properly vet the story and consider both the facts and the impact on Rich’s devastated family. An extremely charitable observer might be willing to grant Hannity that interpretation on Tuesday. But it is impossible to grant him plausible deniability when he has continued to push the story, even as the family seeks retractions and Hannity himself is faced with harsh criticism of his behavior on Twitter. Indeed, as the Fox host’s behavior continued, Podhoretz denounced Hannity’s “monstrous” conduct. 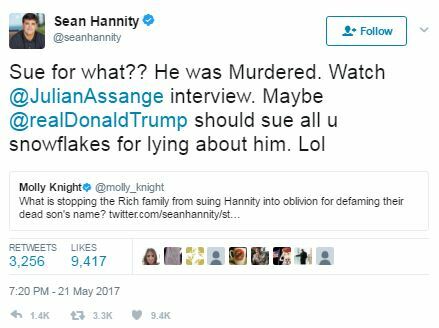 Hannity really believes in the Seth Rich conspiracy theory. Hannity has suggested that Vince Foster, a close friend of Hillary Clinton’s and a former White House aide who committed suicide in 1993, was actually murdered mysteriously. During the 2016 presidential campaign, he hyped National Enquirer reporting about a Clinton “fixer” who helped “set up illicit trysts for Hillary, with men AND women,” and suggested that she might have Parkinson’s disease or suffer from seizures. He frequently claimed that President Barack Obama hadn’t released his birth certificate. He’s asserted that climate change data and job reports have been manipulated for political gain. Is it so hard to accept that Hannity might be fully aware of all the evidence against his Seth Rich theory as well as the pain the family is going through, but nonetheless remain convinced that the Democrats employ assassins to conduct contract hits in retaliation for their employees’ misdeeds? 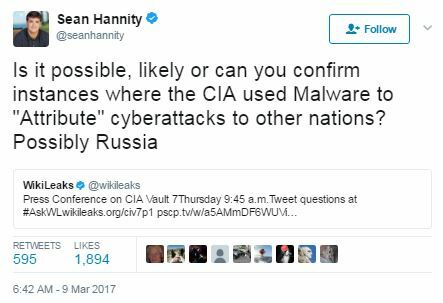 Perhaps Hannity is simply gullible and stupid. It is certainly difficult to rule that out. This sort of motivated reasoning (where individuals come to conclusions they are already inclined to believe, rather than accepting contrary information) is not unusual when a political movement is out of power -- see the recent obsession of some progressives with the absurd conspiracy theories of Louise Mensch and her ilk. But Hannity is running with these stories while his party controls the presidency and both houses of Congress. That speaks to a grave weakness for conservative media figures who remain more interested in attacking Democrats and smearing them with nonsense than they are with passing any positive agenda. Hannity is engaged in a cynical game for political and financial gain. Perhaps Hannity doesn’t really believe that the Democratic Party has John Wick on retainer and uses him only to eliminate low-level employees. Instead, he might simply be playing his audience to protect the president and boost ratings. Hannity’s audience is currently built around his over-the-top shilling for Trump. But because the president’s first few months have been an unmitigated series of disasters, Hannity needs to find something else to talk about. Last week’s stream of devastating headlines made that need all the more important. A conspiracy theory that allows him to attack the “deep state” and the press for covering up the truth, while presenting himself as a likely martyr, would seem like just the ticket. Hannity also desperately needs a new storyline because his audience is flagging badly. The longest-tenured Fox host in the light of Bill O’Reilly’s recent firing, Hannity has lost hundreds of thousands of viewers in recent months. As Eric Boehlert notes, he is no longer dominating his time slot, frequently getting crushed by MSNBC’s The Last Word With Lawrence O’Donnell in the crucial 25-54 demographic. How better to shore up that flagging demographic of young viewers than by making a play for the “alt-right” conservatives who are extremely interested in Seth Rich conspiracy theories and whether the people who rebut them are Jewish? Whatever his reasons, Hannity’s promotion of this garbage and Fox’s apparent inability or unwillingness to rein him in speaks to the network’s larger problems in the Trump era. Under President Obama, Fox defined itself in opposition to the president -- everything he did, large and small, was a disastrous attack on the fabric of America. During the 2016 campaign, the network defined itself in opposition to Clinton, who took on Obama’s mantle, and in support of Trump, whose flaws were airbrushed by Fox commentators. With Trump in the White House, engaging in investigative reporting or providing harsh analyses of potential administration misdeeds are effectively off the table. But with the administration spending much of its time in a defensive crouch, the network also can’t champion great conservative victories -- or even rally behind sustained White House pushes for policy priorities. Instead, the network’s hosts have to join the president’s aides in their foxhole, doing their best to convince their audience that Trump’s failures are simply the result of vicious attacks from the press, or the “deep state,” or the Democrats. Desperate to go on offense, Trump’s media allies are left with promoting conspiracy theories. The risk for the network, however, is if that begins to get stale -- if viewers decide that they no longer believe in Trump and thus are uninterested in Fox’s defense. As those viewers peel off, little by little, the remainder will be an ever-smaller rump audience of core Trump supporters. This could lead to a self-reinforcing cycle, where Fox reacts to its diminished audiences by doubling down on Trump support to retain that core audience, only to see an ever-larger group of viewers leave. Or it could lead to the network shifting against Trump to chase those viewers, only to be abandoned by the Trump core. With Fox’s audience already on the decline, that decision point may be swiftly approaching.